The chairman of the Palestinian Authority (PA), Mahmoud Abbas, has been derided for making a Christmas message in which he refers to Jesus of Nazareth a "Palestinian". Palmor was paraphrasing a famous statement ascribed to Jesus. 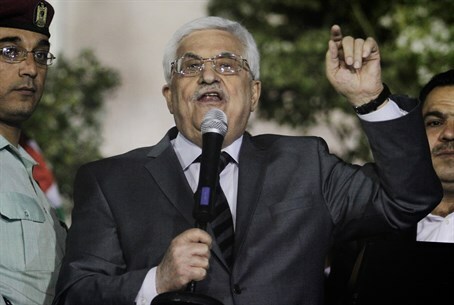 Abbas's message is particularly incongruous, given that Christians have been cruelly persecuted in the PA since its establishment in 1993, with the Christian community in Bethlehem and elsewhere largely driven out by local Muslims. The Christian bible describes Jesus of Nazareth as having been born to a Jewish mother – thus fully qualifying as a Jew. While his paternity is a matter of dispute, it is generally agreed that he was a Jewish rabbi who rebelled against the religious establishment of his day. Either way, the term "Palestinian" did not exist during Jesus' lifetime, and the oft-made declarations by PLO figures that he was a Palestinian Arab have been viewed with derision by Israelis and historians alike. The term “Palestine” was used by Roman conquerors as an alternative to the term Judea, when they overran the Second Jewish Temple, several decades after Jesus's death. By driving out the Jews, renaming the Land of Israel after the Philistines, and changing Jerusalem's name to Aelia Capitolina, the Romans hoped to extinguish Jewish sovereignty over the land forever – but this was not to be. Since the Roman conquest "Palestine" was simply the commonly-used term for the geographical region known to Jews as Eretz Yisrael (the Land of Israel), but "Palestinian" national identity only emerged during the twentieth century as an Arab reaction to the Zionist movement. The Palestine Liberation Organization (PLO) has also claimed that Jesus was "Palestinian" in a recent seasonal video message attacking Israel. In 2010, Samih Ghanadreh, an author from Nazareth, called Jesus "the first Palestinian martyr" on a PA national television network. Ghanadreh claimed that the historical reference had first been made by PLO leader Yasser Arafat.